Booking the Premium Plus Lounge in addition to your fare on the Interislander Ferry adds a certain business class vibe if that’s what you’re after. I’m on the Kaitaki, one of the ferries that ply the waters of the Cook Strait between the North and South Islands of New Zealand. The last time I did this crossing, 14 years ago, I spent much of the three-hourish journey holed up in the cinema watching a latest release. Refurbished in 2013, the cinema is still there, alongside several eateries, as well as a wonderful glass atrium that doubles as a viewing area, but be warned, the few seats go quickly. This time I am booked in to the Kaitaki Plus Lounge that offers respite from the crowds, meals (breakfast and morning tea) and drinks etc. It’s a few days before Christmas and Kiwis and tourists are on the move, so I’m glad I have the option to cocoon myself in the relative quiet of the Lounge. 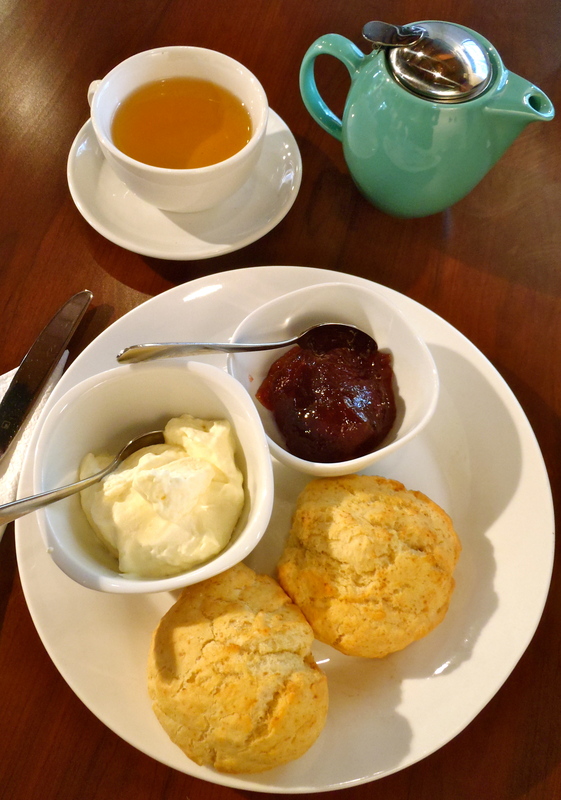 It’s here as we start cruising through the picturesque Marlborough Sounds that I hear the announcement, “scones are now being served.” Not expecting much from the scones in the Lounge as they are cut in half and sitting in the warmth of a bain marie, I give them a shot anyway. The plain scones are better than average and if not having to sit; undignified and rather unappealingly, aren’t half bad. The cream is fresh and thickly whipped and you can help yourself to as much as you like. Even the portion-controlled jam isn’t that bad, but still, I’d prefer it served in a dish. 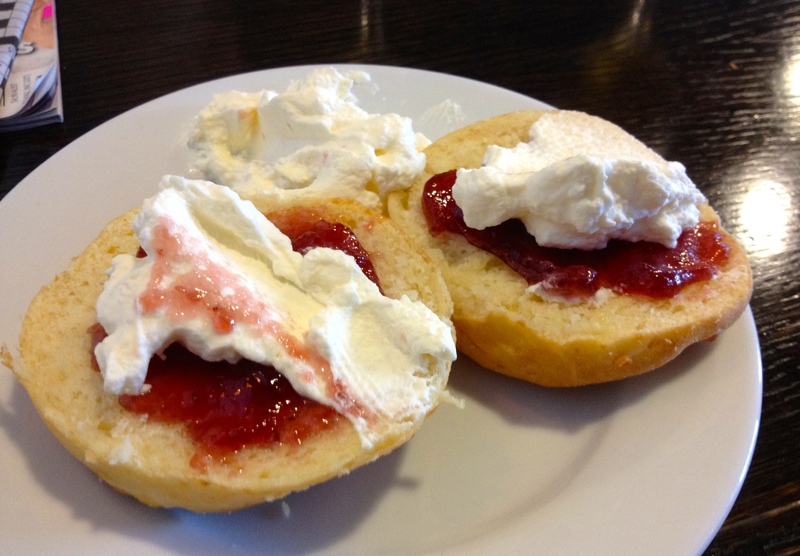 Scones are also served in the cafes on the ferry, just so the folk in cattle class can partake in this lovely British tradition. Tea: In the Kaitaki Plus Lounge there are a selection of tea bags and self-serve tea. Price: Included in Kaitaki Lounge fare. Overall: Upgrade to the Kaitaki Plus lounge if you want to steer clear of the madding crowds. A few kilometres off Highway 1 north of Auckland is the historic town of Puhoi. 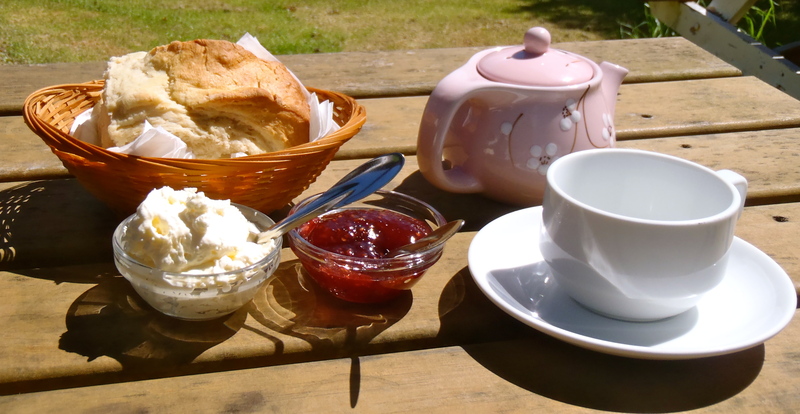 Over 100 years old, Puhoi Cottage is one of the oldest tearooms in New Zealand and has been pumping out cream teas for nearly 40 years. 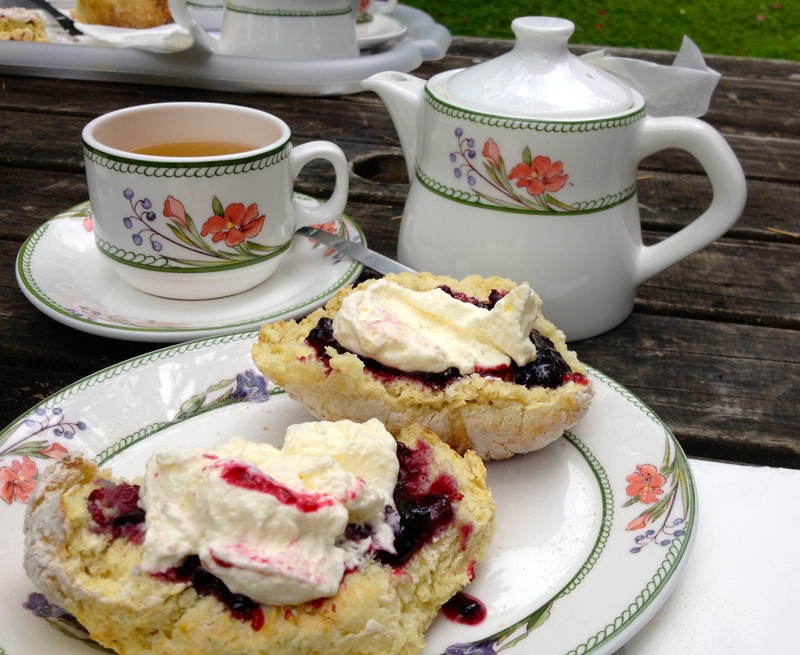 The glorious garden is the perfect place to enjoy a spot of tea and the huge freshly baked scone not only fills the basket but also my belly. On a warm sunny day it’s a place to linger and take a stroll through the rest of the village. Tea: A good selection of loose-leaf and herbal teas served in a good-sized cute teapot. Overall: What a find! Do it!! Wandering around downtown Wellington I stumble upon The Old Bank Arcade just off Lambton Quay. I’m drawn to its historic grandeur and the promise of scones. Smith The Grocer spills out into the arcade, and I don’t realise how much room the cafe takes up until I leave. Even inside, the split-level cafe it’s roomy with walls covered in vintage wares and an impressive butcher’s block sits near the front counter. There’s a stack of fresh date and cheese scones, which is the usual scenario as far as scones go in New Zealand. Normally served with butter, I request cream and jam and have low expectations. When my date scone arrives it is big, fresh and rich with dates, but the jam is lousy as it’s just your average portion controlled variety. The cream tastes like a combination of whipped cream and mock cream and goes well with the ensemble making it a worthwhile diversion. Tea: A good variety of interesting loose-leaf teas served in a small pot. Overall: A great option if you’re out shopping in central Wellington. As soon as I pull up outside the white cottage and leafy garden of Stonestead, I know the Devonshire Tea is going to be a winner. Owner, baker and host, Kevin Bold has been pumping out top quality DTs from the converted garage at the 150 plus year-old property since 2007. We arrive just as he’s popping a tray of date scones in to the oven, to add to the cheese (there they are again New Zealand), plain and sultana he already has available today. There’s nothing flash about his workspace in the garage, and you only want to sit in here if the weather is bad. Instead, head around the back of the house and take tea in the wonderfully lush garden. 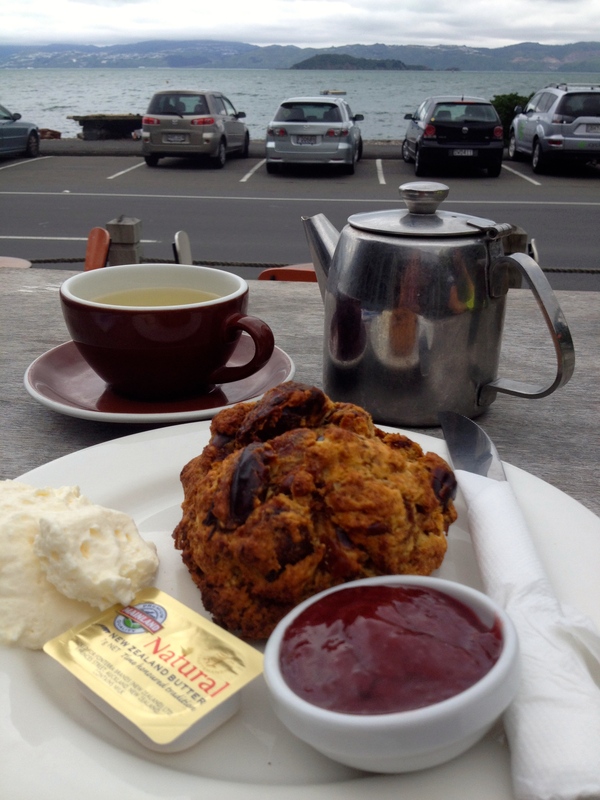 Huge scones resembling mini dampers seem to be the norm in NZ, and I opt for a plain one. Although it’s slightly salty, it is superb: crispy on the outside and all warm and fluffy on the inside. Kevin makes the blackberry, apricot and strawberry jams on site. Can you get any more housemade than this? And the thickly whipped cream complements the spread perfectly. I am so excited that I only read the notice regarding the clotted cream when I look back at my photos after I had left. We weren’t given that option so I’m not sure whether clotted cream is always available, so check. Before you leave stock up on t-leaf T and Stonestead housemade jams, and add a vintage teacup or two to your shopping basket. Open Thursday to Sunday or by arrangement for groups. Tea: A good choice of New Zealand’s own loose-leaf t-leaf T served in a good-sized pot. Overall: A sensational Devonshire Tea at a bargain price! Just inside the main entrance to the Waitangi Treaty Grounds, the small indoor/outdoor Waikokopu Cafe’ does an okay Devonshire Tea especially if you are craving one in rainy weather. Unfortunately, on this particular day, the scones taste like they have been zapped in the microwave for far too long, but the sufficient amount and decent quality jam and cream masks the lack of freshness quite well. Tea: A small variety of loose-leaf tea served in a small pot. 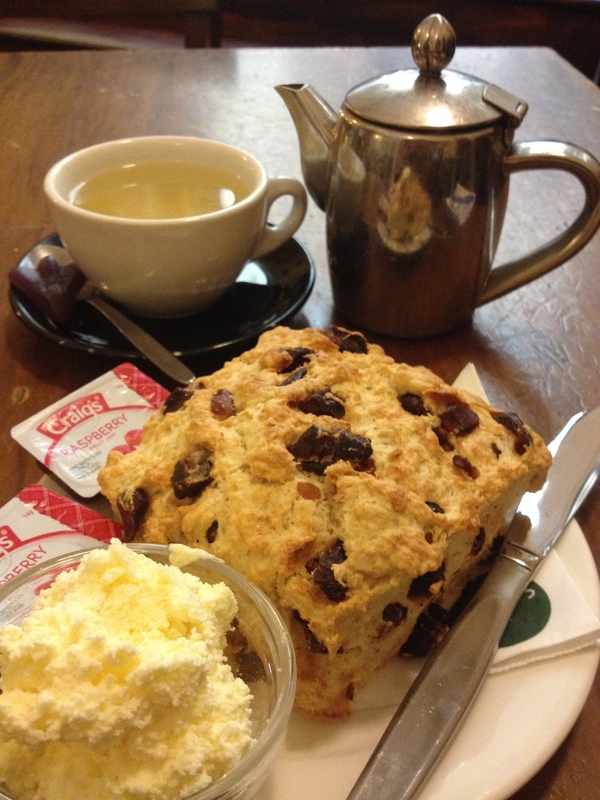 Overall: A must-see historical site for both Kiwis and visitors, but the cafe is a bit slack with the scones.